If you’ve ever gone to any sort of retail store whatsoever, then there’s a good chance you’ve seen a counter display boxes or POP boxes sitting around somewhere in that store, and if you haven’t then that would be pretty awkward. 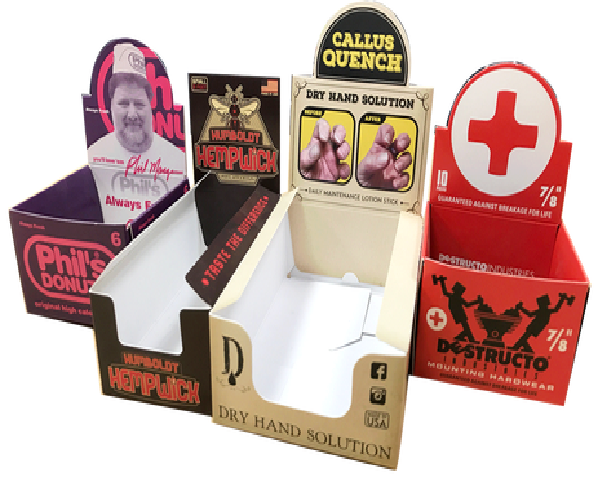 At Business Image Printing you can create your very own custom printed counter display boxes or POP boxes made specifically for your own products. With our team of highly-skilled professionals, there’s no need to worry at all about the quality and finesse of your custom products display box as our team is well equipped to bring only the finest in custom printed boxes for your product. You can choose from a wide selection of diverse and professional pre-made templates or have us create a unique template just for your product specifically, and not only can we help you create your own template but we can also offer you a variety of additional features to compliment your custom printed display box with cheap prices and fast turnaround. All you have to do is contact us through email or phone and we can discuss your ideas and vision for your product’s custom packaging. With Business Image Printing the possibilities are endless, the only limit is your imagination of what you believe your product’s packaging should look like. For your entire product packaging needs Business Image Printing has just the right answer. For more information regarding any special additional features such as spot UV coating, hot stamp foiling, or embossing, feel free to contact us for more details.